Minneapolis sewer replacement and drain cleaning contractors at MCQ Plumbing Heating AC have just announced a new coupon and they are proud to be offering $15 off any plumbing repair, drain cleaning, air conditioning and other services thru 08/01/2015. A good drain cleaning and plumbing company is hard to find. 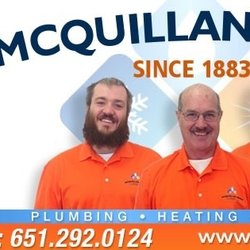 Minneapolis sewer repair and drain cleaning professionals at MCQ Plumbing Heating AC have just announced a new coupon for $15 off of any service they provide including plumbing, heating and air conditioning. The new MCQ Plumbing Heating AC coupon offers services relating to plumbing and HVAC repair. “This new coupon is part of a customer outreach program. We have been in business for over 100 years and are making a huge comeback. This discount is a way for new people to try us while getting a deal on service at the same time,” says John of MCQ Plumbing Heating AC in Minneapolis. Minneapolis drain cleaning companies should be chosen carefully. MCQ Plumbing Heating AC has developed a solid reputation as being a trust worthy company according to their customers. They also train their employees to be courteous and professional while helping them save money by only recommending needed repairs. Consumers should watch out for unscrupulous plumbing companies that take advantage of unassuming homeowners. “When the drain or sewer is backed people can call us for honest and reliable service. We use the most advanced equipment to save people money,” says John of MCQ Plumbing Heating AC. Minneapolis sewer replacement and repair contractors at MCQ Plumbing Heating AC can use a video camera to correctly diagnose sewer problems. "The best way to troubleshoot a sewer problem is to run the camera into the sewer pipe to see exactly what the problem is. We can see tree roots, pipe breaks and other problems. By knowing exactly where the problem is we can recommend the repair that is right for the job," says John. St Paul sewer repair pros at MCQ Plumbing Heating AC are excited about offering this new coupon for the Twin Cities area. "When we come to your home we treat you with courtesy and respect. We also respect your property and clean up our mess. Our technicians are highly trained, uniformed and background checked. When you see our truck pulling up to your house you can be confident in the plumbing company choice you have made. We are hoping this new discount will give more people a chance to try our company," says John. To learn more about MCQ Plumbing Heating AC please visit their website. To schedule service in Minneapolis please call 612-345-9493. People are also encouraged to red their many positive online reviews for plumbing repair, drain cleaning, water heater service, trenchless pipe replacement, re-piping, air conditioning and other plumbing services in Minneapolis.